Everybody who’s anybody in the party is pitching in to help oust the GOP governor. MILWAUKEE, Wis. — Want to know just how important Wisconsin is in the midterm election? Take a look at the political luminaries who visited over the past six days. Sen. Kamala Harris on Sunday. Sen. Bernie Sanders on Monday. President Donald Trump on Wednesday. And, the biggest prize of all for Democrats, former President Barack Obama on Friday. With a tight contest for Speaker Paul Ryan’s open congressional seat, a competitive Senate race and a battle for governor that is about as close as it can get, the state that slipped through Democrats’ hands in the 2016 presidential election is getting obsessive attention from both parties in the run-up to Election Day. The marquee race features Scott Walker, beloved by Republicans nationally, who is attempting to win his third term as governor amid signs that the independents who made all the difference to his victories in the past are now moving away from him. Schools Superintendent Tony Evers holds a marginal lead in recent polls, but he needs a big turnout from Democratic strongholds of Madison and Milwaukee, where many voters stayed home in 2016. 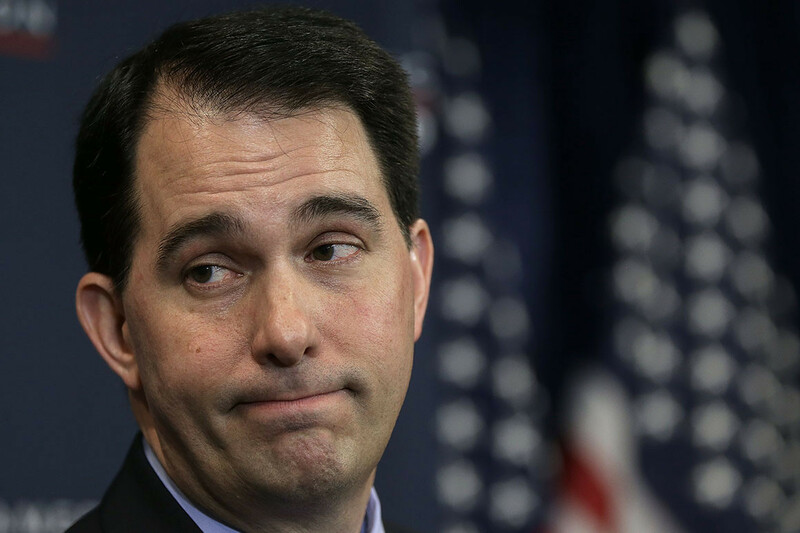 “Only a fool thinks that race isn’t a coin flip,” Republican strategist Brandon Scholz said of the Walker-Evers contest. And it’s a toss-up that has major implications for both parties. Whoever wins the governor’s race will head up the 2020 round of redistricting and get a key role in shaping the makeup of the state’s congressional map. For Democrats, knocking out a longtime nemesis like Walker would offer a significant morale boost both here and nationally, and lay the groundwork for winning back the state in the 2020 presidential election. Likewise, if Walker can hold on for yet another term, Republicans would be emboldened — a veteran warrior for conservative values and against organized labor will have beaten back a supposed blue wave. With Wisconsin’s electorate so evenly split, partisan energy is now shifting to rigorous GOTV campaigns. Both parties are trotting out their most visible surrogates and sinking resources into a turnout operation designed to energize their base and to draw a small group of independent voters who could end up tilting the election. Wisconsin got a vivid reminder of the impact of get out the vote efforts on Election Day 2016, when the state posted its worst voter turnout in 16 years, which included depressed numbers in Milwaukee. Trump carried the state by just 27,000 voters. By contrast, Wisconsin voters turned out in big numbers in 2008, when Obama won his first election by 14 percentage points. It’s no wonder then that Democrats dispatched Obama to Milwaukee today, as the party hopes the former president can do what Hillary Clinton was unable to do in 2016: drive the party’s base to the polls. Next week, former Vice President Joe Biden will headline rallies in Milwaukee and Madison, the state’s two largest cities and Democratic strongholds. Earlier this week, Sanders rallied voters in Milwaukee for Evers. But he also brought his message of economic populism to a union hall here in Kenosha, where a fierce battle over Ryan’s soon-to-be vacant House seat is underway between Democrat Randy “Ironstache” Bryce and Republican Bryan Steil. Sanders, who carried Wisconsin over Hillary Clinton in the 2016 primary, hung his argument on Trump’s tax and health care policies, telling the room that he understood why some Wisconsin residents voted for Trump, but said they were sold a bill of goods. Helping combat the parade of Democratic superstars, the Republican Governors Association on Thursday launched a new TV ad targeting Evers on education, charging he supports bureaucrats over Wisconsin students. It is his challenge to Walker that has drawn the most attention both inside and outside state borders. Walker faces voter fatigue as he seeks his third term, but he is an experienced hand at winning in Wisconsin, with two gubernatorial wins and a third in a recall election. The governor’s long been better funded than Evers and has a solid ground operation in place. Whether the star-studded surrogate lineup can translate into real votes for Democrats, remains to be seen. This weekend, Democratic Governors Association director Jay Inslee will be behind yet another GOTV push in the state. A roaring crowd who came out to see Trump in north-central Wisconsin, a Republican bastion, suggested GOP enthusiasm remains high as well. Then the president got local, pointing out that he worked with Walker to lure Foxconn, a manufacturer that’s poised to bring in 13,000 jobs at the high end, though it has also drawn controversy after the state handed it lucrative tax breaks. Trump brought Walker on stage as well as Leah Vukmir, who is attempting to unseat Democratic Sen. Tammy Baldwin, who’s held a consistent lead in the polls. As in other states, Wisconsin Democrats are focusing their messaging on health care and hitting hard on the issue of pre-existing conditions. There’s evidence Republicans recognize the potency of the attack. A new Walker ad features his mom and her battle with cancer. In Wednesday night’s boisterous Trump rally, Walker took the stage and referenced his wife’s pre-existing condition: Type 1 Diabetes. On Friday, Obama took issue with that statement, saying Republicans have worked to repeal protections for pre-existing conditions but have now changed their tune in the run-up to the midterms. Obama specifically called out Walker, who has backed two plans that would curb pre-existing condition protections. Walker has said he would support new legislation offering such protections.